Usage: Take 1 to 3 softgels per day with meals, or as directed by your qualified health care consultant. Pantethine is a derivative of vitamin B5 and the stable disulfate form of pantetheine, which is the active component of Coenzyme A (CoA). 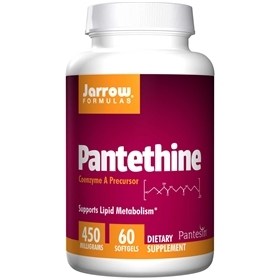 Pantethine supports lipid metabolism by its ability to raise levels of CoA, a cofactor involved in several metabolic pathways including carbohydrate and lipid metabolism. CoA combines with acetyl groups to form Acetyl CoA, a participant in energy production. Softgel consists of gelatin, glycerin, and water. Natural annatto and carob are included as a light barrier.